Crazy Shirts is a leading brand and retailer of vibrant and quirky t-shirts and custom printed designs, based out of Honolulu, Hawaii. The privately held company sells it's products through 35 traditional retail outlets across the United States, and online at CrazyShirts.com. Here you can make savings on your purchases by using Crazy Shirts coupons, a list of which we keep updated at Coupofy. Be sure to check back before ordering to find the best offers and deals. The business traces its roots to the early 60s when teenager Rick Ralston and his friend began spray painting designs on plain t-shirts and beach towels. They set up shop from a sidewalk stand on Santa Catalina Island, customizing and printing tourists' shirts. In 1964 the company was formally founded as a location at the Waikiki bazaar in Honolulu, and the spray paint was replaced with professional screen printing. Today the company owns the largest printing facility in Hawaii and Ralston is often credited with being the pioneer of modern printed t-shirts. 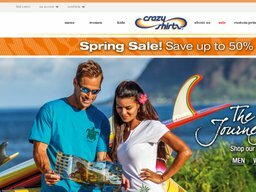 The online store was launched in 1992, and in 2001 Crazy Shirts was acquired by Only The Best Inc. Mark Hollander currently serves as President and CEO. Crazy Shirts stocks T-Shirts and other types of clothing, catering to Men, Women and Children. You can browse via those three categories or visit the sales page for a bargain. They call their traditional style Tee the "Classic Crew," which comes in a wide variety of base colors including: White, Black Navy; as well as unique dyes such as Coffee, Hemp, Beer, Chocolate, Run, Wine, Chile, Ti Leaf, and more. There are also Polo Shirts, Vests, Jumpers, Jackets, Pants, Shorts, Swimwear, Women's Mini Tees, and more. Unless otherwise stated your Crazy Shirts coupon code can be sued for products in any of the above categories. Popular Crazy Shirt exclusive brands/collections include: Kai Nui, Manu A Manu, Tika Punch, Sabato, Hinatea, Wyland, American Pride, Kliban Cat, Rainforest, and more. You can also buy accessories such as Sandals, Hats, Sunglasses, and Jewelry. If you want to print your own custom design you can does so from the Custom Printing page, though you have to purchase a minimum of 24 units, and this is usually aimed at events organizers, businesses, designers, teams and other groups, rather than individuals. Artwork must be high quality and in .ai and .eps files. If you're looking to get somebody a gift but aren't sure what to purchase, you can buy a gift card (available in values between $10 and $100), allowing them to make their own purchases. The primary mode of payment accepted by Crazy Shirts is through credit cards. You can also use their own branded gift cards for all or part of your order, with the remaining balance paid by credit card. To redeem a Crazy Shirts coupon code, all you have to do is enter it in to the promotional box during checkout. 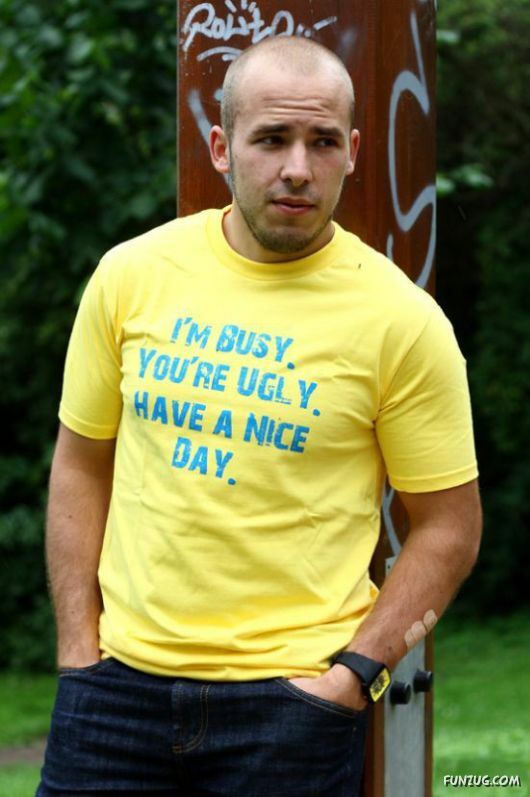 Crazy Shirts cater to United States and International customers from the single website. The cost of shipping is based on the value of your order, starting at $7.95 for orders up to $40 and reaching $11.95 for orders between $75.01 and $125. Above this amount the cost is calculated at 12% of the order value. Canadian and International customers pay the same rate with an added $15. Standard delivery takes up to 7 business days in the US and up to 2 weeks for overseas. You can also pay extra for FedEx Economy (an additional $9 for 2 to 3 days), and FedEx Standard (an additional $18 for 1 to 2 days. The only international express option is USPS Express International for an additional $21, which can take up to 10 business days. From time to time you can also get free shipping by using the corresponding Crazy Shirts promo code. Crazy Shirts does not have a set timeframe for returns, so you should send items back as soon as possible so it isn't rejected. They accept returns no questions asked, so long as the items are in their brand new condition, or you received them in an unsatisfactory, damaged or defective condition. This can be for an exchange or refund. Attn: Exchange & Returns Dept.